I've been seeing lots of stuffed pepper recipes lately and thought I would try to make something new. So, I decided to make Italian stuffed peppers, using orzo instead of rice. For anyone who doesn't know what orzo is (aka me before I cooked this recipe), orzo is a rice-shaped pasta. It looks super similar to rice, which makes the two pretty easy to mix up. Although the two grains look alike, the textures are distinct and will change the taste of the dish. So just make sure when you are getting some orzo you don't mistakenly get rice. Now that we have familiarized ourselves with the main ingredient, let's cook! Here we are going to make almost like a small batch of tomato bruschetta, this will give a nice light, fresh touch to the dish. Do them first to give the tomatoes lots of time to marinate, while everything else is cooking. Mix everything together, then set aside to marinate. Now let's move on to bigger and better things like preparing those peppers. Don't forget to preheat oven to 400° F.
Then, slice the peppers in half. You can leave the stem on the red pepper if you want to add a decorative splash to your dish. If not, you can discard it, along with the seeds and membrane. Next, drizzle the peppers with a little olive oil - about 1-2 tsbsp, sprinkle with a 1-clove of garlic, and a pinch of salt and pepper. 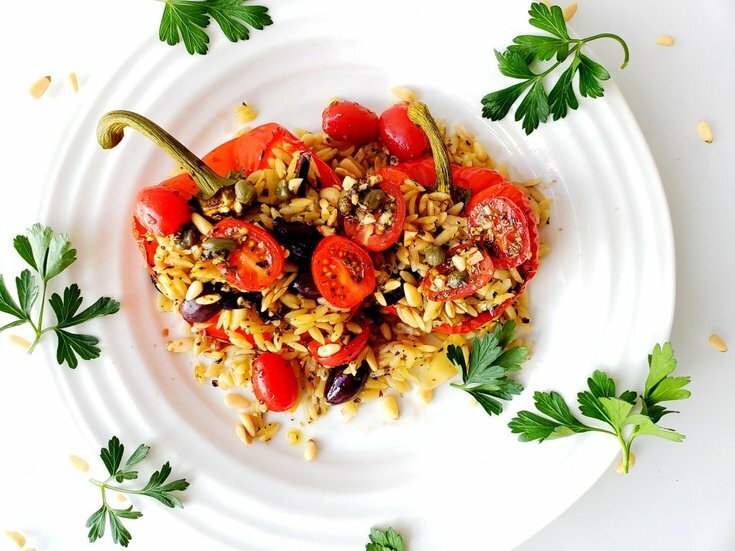 Once spiced, roast the peppers in a casserole dish for 20-30 minutes at 400° F.
To prepare the stuffing, first, cook the orzo according to the package. This will be very similar to cooking pasta, so about 6 minutes until it's al dente. 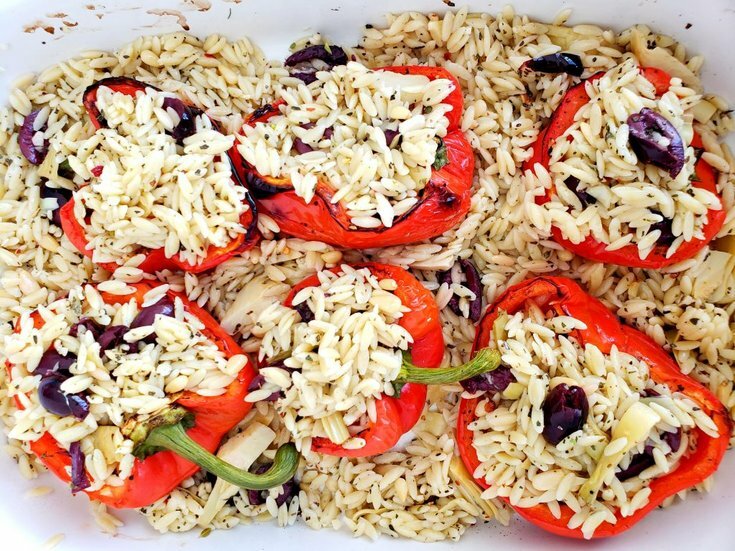 Make sure you don't overcook if anything undercook because the orzo will be going back in the oven for 10-15 minutes once it has been stuffed into the peppers. Since we are making Italian Stuffed peppers, we are going to need some Italian Flavours. 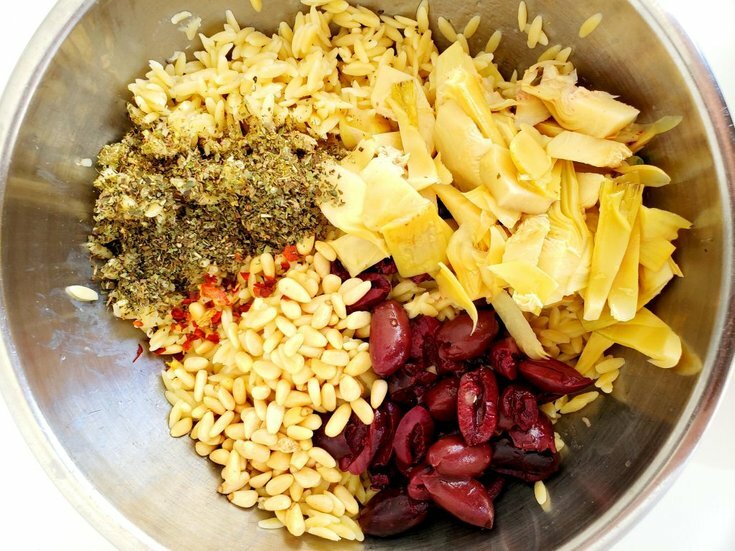 So, once the orzo is done mix it in with the kalamata olives, marinated artichoke hearts, pine nuts, basil, red pepper flakes, and oregano. Set this aside for now. Don't worry we are almost done. This recipe does seem to have a long list of ingredients, but keep in mind that a lot of the ingredients are repetitive. ALSO, this dish is amazing and worth every step. Finally, time to put everything together! Stuff the orzo mixture into the roasted red peppers. If there is some of the mixture left over, stuff it around the peppers in the casserole dish. Next, squeeze the small lemon over the top of the stuffed peppers, then put the casserole dish into the oven at 350° F for 10-15 minutes- just to warm it all back up. The peppers are cooked and it is almost time to indulge. 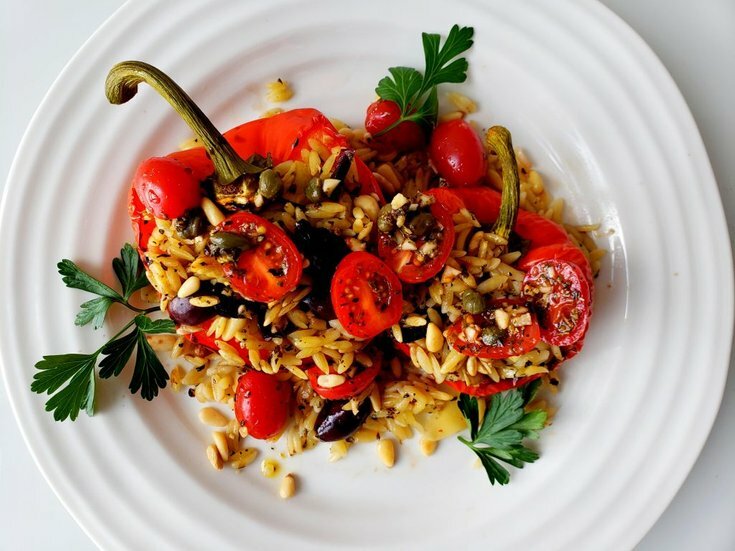 Plate the orzo stuffed peppers, then top with the marinated tomato toppings and a drizzle of balsamic. Also, add extra toasted pine nuts to the top for some added texture. First, slice the cherry tomatoes in half. Then, add them to a mixing bowl with 1 clove of minced garlic, olive oil, capers, basil, oregano, and red pepper flakes. Set aside to marinate. Next, cut the peppers in half, discard the seeds and membrane. Drizzle the peppers with about 1-2 tbsp of olive oil. Then, sprinkle with a pinch of salt and pepper, and the 1 clove of garlic. 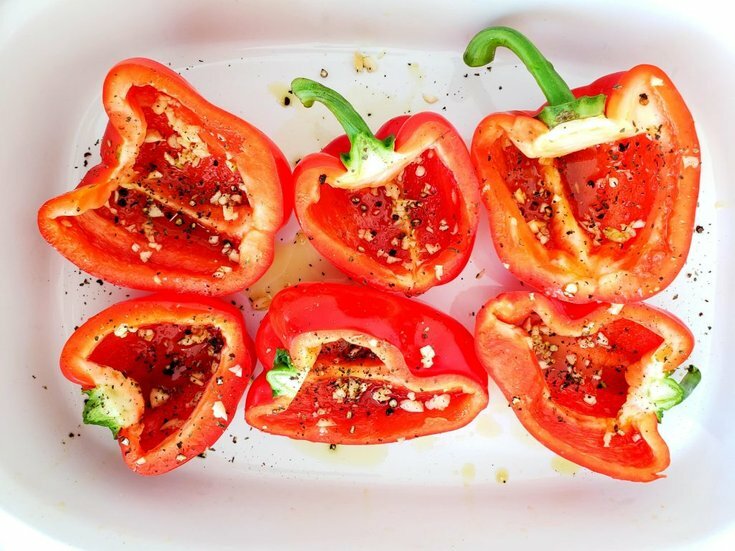 Now, roast the peppers in a casserole dish for 20-30 minutes at 400° F.
Cook orzo according to the package (very similar to cooking pasta), about 6 minutes. In a large bowl, mix cooked orzo, kalamata olives, marinated artichoke hearts, pine nuts, basil, red pepper flakes, and oregano. Once mixed, stuff it into the roasted red peppers. Squeeze the lemon over the top of the stuffed peppers, then put in the oven at 350° F for 10-15 minutes- just to warm it all back up. 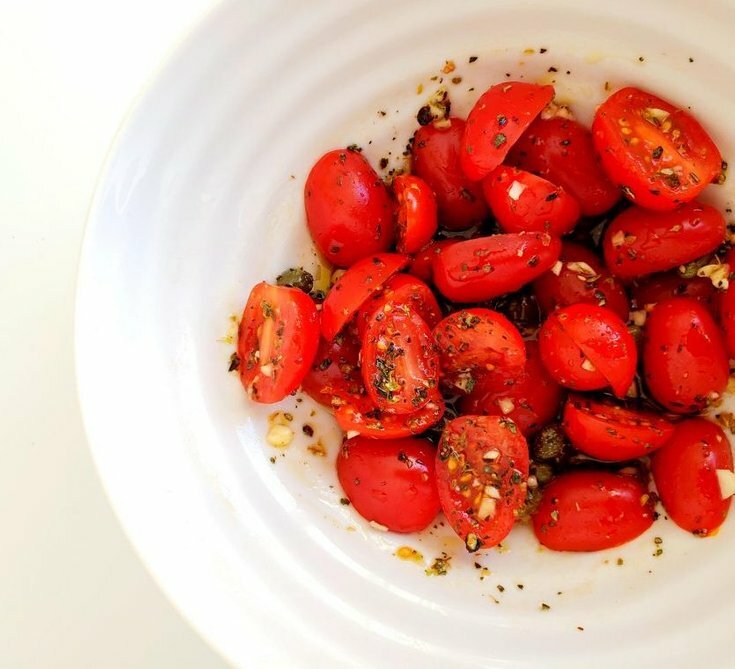 When cooked, remove from oven, plate, then top with the marinated tomato toppings and a drizzle of balsamic. Also, add extra toasted pine nuts to the top if you want your dish to look a tad bit fancy.